After a relaxed start to the day (I stayed in my PJs until noon! ), it was time to visit the allotment. I was surprised how spring-like it was outside. The sun shone, the sky was clear of cloud and full of bird song. If the temperature had been a few degrees higher it could easily have passed for late April. I’ve been in a privileged position during the winter months. The structural work carried out to remedy the flooding we endure on our site has really paid off and the with many of the beds and paths now built, much of my time spent on the plot was to check the water level and pull the odd weed. 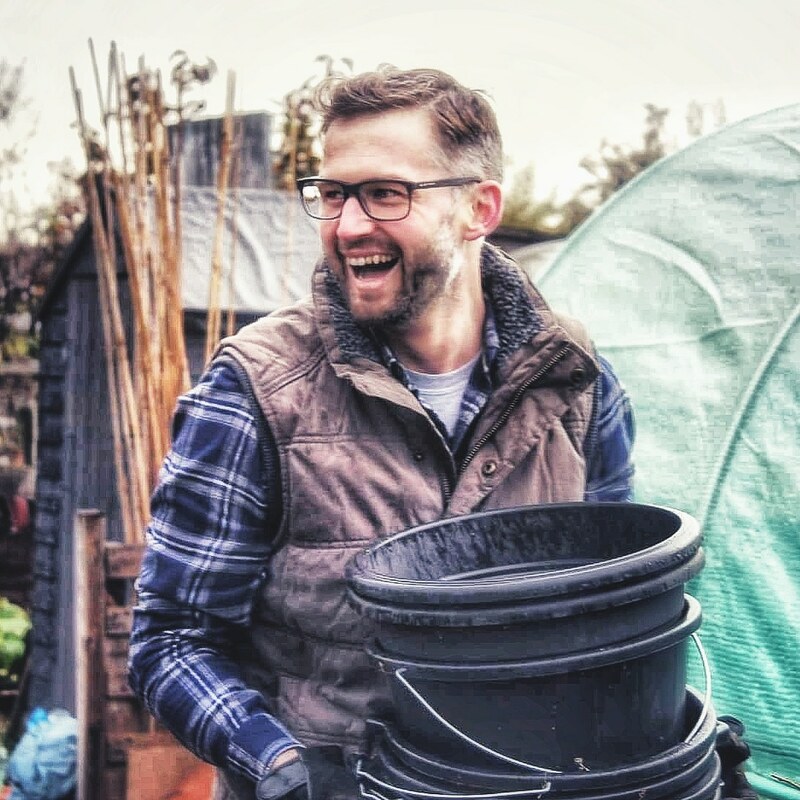 I recently wrote an article about my decision to move to a no-dig approach on the allotment. I’m very enthusiastic to adopt this method, not just because it has a cumulative effect of healthier soil but because of the efficiency and time saving it allows when managing the plot. I’ve made a start with the no-dig. My existing beds are in great shape since they were cleared in the autumn of last season’s crops and any weeds. Although I plan to make as much of my own compost as possible to meet the requirements of no-dig, I have bought some to cover the beds, ready for the start of spring. What a difference a day makes. The grey clouds returned and with them, the stillness of yesterday was gone, blown away in a fresh breeze. A light drizzle made the day even more dreary but I was determined to visit the plot as being there always makes me happy and revitalised. With a belly full of bacon, I headed off. The site was empty and as much as I prefer to see an allotment site full with busy plot holders, I also enjoy the opportunity of my own company to focus on what needs to be done. There are many allotment related things that get me excited, a big pile of manure is certainly one of them. On our allotments, I’m also delighted by the sight of free wood chips and as I walked towards my plot, there they were – a steaming, gold mountain! The entire area of my allotment is 70ft x 25ft. That’s a wonderful amount of space to grow your own veg and I have moved along a little with the development of the thirty feet of as yet uncultivated part of the plot. Although I’m now taking a no-dig approach, I still want to dig out the path network to ensure I reduce the risk of flooding during the winter month. I also know it works. Having so much wood chip available, it was a great opportunity to carry on with the task. As I construct new beds, I’m not turning the ground over but I am digging out the paths and using the excavated soil to build up the beds. I’m in no particular rush to use these new beds and so I’m covering the mounds of earth with thick tarpaulin to starve any grass of light. In a few months, I’ll build a frame for beds around the mounds, level out the soil and add more compost on top. This approach is already saving me a lot of time and means I’m able to move onto constructing new beds fairly quickly. I genuinely feel I will have cultivated all of the allotment space by the end of the year and so come next season, the number of beds available will be substantial. The garlic planted back in October is doing well. I have two rows of ‘Casablanca‘ which someone gave to me and it’s rising well out of the soil. The Elephant garlic, planted around the same time is also making an appearance too. I have two rows of ‘Solent Wight‘, another variety of garlic I bought from The Garlic Farm in December. That’s peeking through the surface of the soil too. The blueberry bushes are still asleep. They were planted last spring and grew very well over the summer. They won’t provide fruit in the first season, but the colour of their leaves last autumn was magnificent. Even in winter, their red stems are a bright sight on the allotment when everywhere else is rather bare. Us gardeners are a funny lot. When winter arrives, we are glum the gardening for the season has passed. Then, spring sneaks up on us and we are checking ourselves and wondering if we will ever be ready to get everything started. I’m excited the new season is now on the horizon. I hope to sow some onions, lettuce and spinach over the next week. How is your allotment or kitchen garden coming along? Are you ready and excited for the spring? I’d love to hear from you. Drop me a comment below or connect with me on Twitter, Facebook and Instagram. Previous Why make compost? It’s the heart of the allotment garden. Looking good. We spent Saturday morning hand weeding our new plot. Then we were too sore to move on Sunday! I’ll be following your no dig adventures with interest! Now, viewing your progress, your plan of attack is paying dividends. Raising everything above the “flood plain” should see you reaping the results. Though I’m a bit concerned that you wore your PJ’s for half the day and then took them off and went to the allotment. If you need a character reference for the Court, please let me know. I will quietly mourn the chair which, from your latest photo portfolio, is clearly homeless.